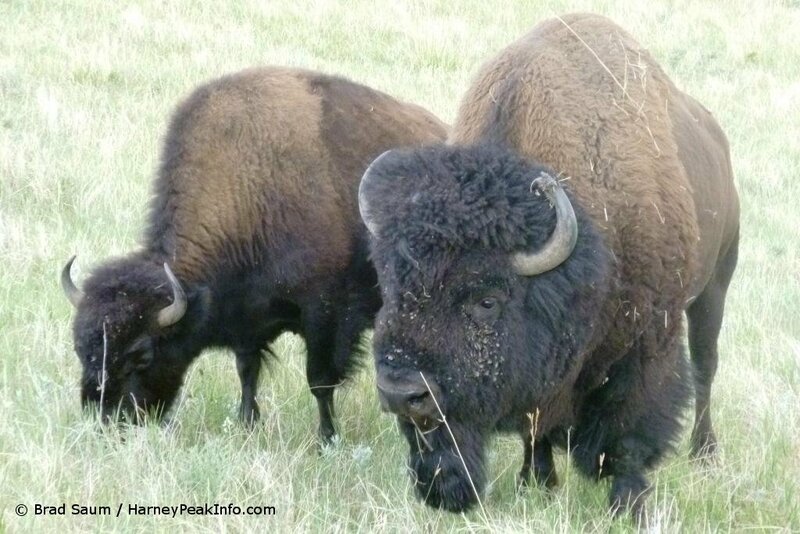 Custer State Park buffalo are a herd of about 1,300 that can grow to 6 feet tall and weigh over 2,000 pounds. The North American bison are more commonly known as buffalo. Custer State Park buffalo can typically be seen from the Wildlife Loop Road. The Wildlife Loop Road is typically a great place to see Custer State Park buffalo, along with other wildlife such as deer, coyote and antelope. In 1914 when the park was known as Custer State Game Sanctuary, 36 bison were purchased to start the herd. In less than 30 years, the herd had grown to over 2,500 and were overgrazing the park. The number of buffalo in the herd was reduced and each year a Buffalo Roundup is conducted to manage the herd. The 47th annual Custer State Park Buffalo Roundup is scheduled for September 24, 2012, and on September 30th in 2013 and September 29th in 2014. Custer State Park buffalo can be observed from the corrals on the Wildlife Loop Road. Arrive about 7am – no reservations are needed to view the Custer State Park Buffalo Roundup. For identification purposes Custer State Park buffalo calves are branded with a single digit number with an “S” below it. The number represents the last digit of the year the calves were born and the “S” indicates they are part of the State’s herd. A bison has a shaggy, long, dark brown winter coat, and a lighter weight, lighter brown summer coat. The heads and forequarters are massive, and both sexes have short, curved horns that can grow up to 2 feet (61 cm) long, which they use in fighting for status within the herd and for defense. The term “buffalo” may be considered a misnomer for this animal, as it is only distantly related to either of the two “true buffalo”, the Asian water buffalo and the African buffalo. However, “bison” is a Greek word meaning ox-like animal, while “buffalo” originated with the French fur trappers who called these massive beasts bœufs, meaning ox or bullock – so both names, “bison” and “buffalo,” have a similar meaning. In reference to this animal, the term “buffalo,” which dates to 1635, has a much longer history than the term “bison,” which was first recorded in 1774.